Ninth Letter is pleased to be able to feature "Miser's Farthings," a long form essay by Patrick Madden that we'll be serializing in three parts. Madden's essay is obsessed--in the best way--with lost moments and time that cannot be reclaimed--and who among us has not stewed in a car seat during rush hour? Madden first notices life's process of subtraction in an elevator ride that doesn't go as smoothly as he'd like, leading him to count the seconds with a stopwatch in another elevator ride. But such concentration inevitably leads to unbidden memory, and off his essay then goes, into the byways of lost time worth saving. What is the value of all this time, these little rescued moments, and how does the literary form of the essay help us to approach them? Read on, and Patrick Madden will show you the way. On Friday, 7 March 2007, in the elevator on the first floor of the Joseph F. Smith Building at Brigham Young University around noontime, two young women, in spritely health to all views, jumped on just as the doors were closing, with an "oh, good!" and followed by something as "I can't believe we made it" or "good timing," then pressed the button for the second floor. I begrudged the lost seconds that the door took to close again, and the seconds waiting on the second floor for the second of them to get out, as I made my way, fully justified I thought, from the basement below to the fourth and top floor of the building. This is time, I thought, that was robbed from me and is gone entirely. At that moment there came to me the recognizable spiritual tingle that indicates an essay-in-embryo. I anymore feel that essays preexist me, that I have the charge of transcribing them, as amanuensis, a word I had learned only recently in the context of essay writing, from Alexander Smith: "The world is everywhere whispering essays, and one need only be the world's amanuensis." It's one of the few non-rock-n-roll-lyrical quotes I have committed to memory. In any case, it helps my theory (of myself as scribe, not "creator"), too, that no matter what novel idea I think I have, I inevitably find it, writ better, in an essay by one of the Great Dead. and shortest periods, like miser's farthings. What we know, or think we know, is always surrounded by mystery, which makes an essay both necessary and indeterminate, both essential and futile. This is why we're almost obligated to damn the obstacles, capture those moments and specimens, hold them still for examination and meditation. 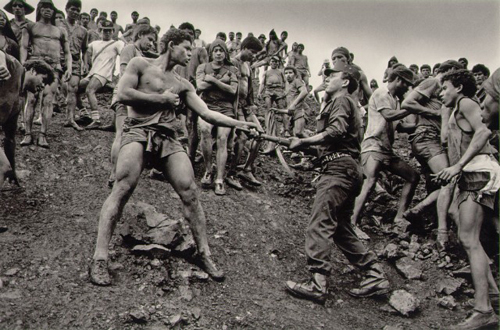 I once heard Sebastião Salgado, the brilliant Brazilian photographer, humbly submit that an entire book including hundreds of images represented only a few seconds of accumulated time, given that each picture captured only fractioned-seconds of reflected light. Of course, just outside those images were hundreds and hundreds of hours spent studying and practicing and traveling and waiting and developing and selecting. And inside those images were enduring souls with whole lives of sleeping and waking and working and playing... Each picture was an inconceivably small intersection, a pinpoint of time suggesting the briefly crossed paths of photographer and photographed. I thought: perhaps this is the scale we work at. A collection of a few thousand words, easily read in half an hour, represents the labor of a hundred hours. In order to create something worth sharing, we must toil away our lives. This is what concerns me: that the vast part of life is absorbed into the unremembered whole, that so much is routine and forgotten, and that, going forward into what time we have left, so much of our life is pointless, spinning of wheels, converting experience into sand through a glass or a sweeping hand around a clock face. And worse, we consent to live this way, only partially present, sleepwalking through life, as the poet says. So I determined to live deliberately, or at least to clock the expenditures, to time my moments and give me some record of what I do all day, to rescue by remembering at least a few days of drudgery (and perhaps to find that it's not drudgery at all). Often I spout to unsuspecting bystanders my Kinetic Theory of Tasks, designed in parallel with Boyle's discovery about gases: that our chores expand to fill the volume of the temporal container we have available. I feel as busy during my summer vacation as during a full semester of teaching. Until I am pressed to finish something, I dilly-dally, telling myself that I'm working on it, but in reality fiddling and idling. So, with stopwatch dangling fashionably about my neck (Karina says I look like "an absolute weirdo"), I set out to time my life. Those elevator doors that bounced open to admit the young women, then stood still a while before closing, then opened just one floor up, a floor the women could have easily walked to on the stairs: they take 8.9 seconds to close again. An entire trip up from the basement to my floor takes 27.2 seconds. That trip with two stops (say, on the first and second floors, where those energetic girls got on and off) takes at least 55.6 seconds, and that's if nobody actually gets on or off. Add in time for dawdling at the doors, and you're close to a minute and a half. Pushing the CLOSE DOOR button gives you such a small advantage over not pushing it that I am unconvinced it really does anything. I know these approximate-accurate numbers despite the dozens of unwitting coworkers and students attempting to foil my measurements. Although I performed my experiment during the summer, when no classes were in session, and in the late afternoon, when most people should have gone home, nearly every time I tried to get a clean run or to test the doors, somebody was waiting to get on (and then, soon after, off). They gave me a variety of quizzical looks as they noticed the stopwatch and whenever we'd reached top or bottom and I refused to exit. Like most people, I remain quiet in elevators, staring at the door, shifting from foot to foot, avoiding eye contact, mostly keeping to myself. Sometimes I think----rather, always I think, but rarely do I think about anything profound or beautiful. But the time I've spent in elevators, as representative of all the moments I've spent simply getting from here to there, sums to a significant segment of my life, almost entirely forgotten. I cannot tell you a narrative of any elevator ride, except the above-mentioned, and the time Karina and I rode to the top of the Empire State Building to share a first kiss, after An Affair to Remember, which I know only from Sleepless in Seattle, which revises that central plot point, succeeding where the other tragically fails. So I guess, really, we were reenacting Tom Hanks and Meg Ryan's rendezvous, as well as the cliché perpetuated by countless other hopeless romantics. I'm sorry that I doubted you; I was so unfair. You were in a car crash, and you lost your hair. --Ringo Starr, "Don't Pass Me By"
nor in Sleepless in Seattle (the hapless characters finally meet, against all odds--except for movie formula odds--and hold hands while gazing amazed into each other's eyes). You're right, I suppose, but I didn't quite know that then, it being the very earliest days of the Internet, before I could rewatch the final five minutes of a film for confirmation, and me being much more interested in brushing my beloved's lips than in renting old movies to verify their plots. And even if I had known that each represents the building as unattainable bliss, I think I'd still have taken Karina there, so untroubled was I by the stain of cliché. Nor was I then so troubled by time's irrepressible flight. The fleeting moments that made up my life seemed to stretch before me to a point so distant it may as well have been the edge of the universe. I was giddy with memories of Karina's stunning beauty (we'd met in Montevideo, when I was a missionary, and relationships were off limits) and afloat in the touch of her hand, the lilt in her laugh. I'd dreamed of her for torturously long months and now here she was, as present as any being had ever been. a girl, and you look up and there is your dream before you. In that long ago elevator I was rapt, understanding dully that time was passing, but experiencing the string of moments as a caesura, a suspension of life. Her gaze spellbinding, our fingers intertwining, I held infinity in the palm of my hand, felt eternity in a tower. Yet the kiss a few moments later, on the observation deck, lasted all of three seconds, I would estimate. Subsequent kisses in quick succession, attempts to fit our lips in all configurations, moving noses this way and that, might have lasted two minutes more before we rejoined our sisters (they'd discreetly wandered to look out over New Jersey) and eventually descended, still hand in hand. Since then, I have kissed Karina and she has kissed me thousands of times, tens-, perhaps hundreds of thousands of times, sometimes quickly as one of us takes leave, sometimes in prolonged passionate pecks, oscillating osculations [Thank you, Thesaurus!]. I wish now that I had timed our smooches, the better to aggregate them here, but suffice it to suspect that across our seventeen years I have been locked to her lips, and she to mine, for weeks and weeks (and sleepless weeks, at that). And, of course, a kiss does not happen only in the moments of contact. left a sweetness upon my lips for several hours after. And for years after, in memory. Not a bad way to spend time, to build a life beyond that distant afternoon on top of the world when our lips first met. Of course, life is not all kisses and hand-holding. Days are utterly filled with menial tasks, the kinds of things we'd rather avoid, hire someone else to do, automate. My routine is far from routine, but lately, at least, I tend to wake up early, around 5:30, roll out of bed, shuffle into the bathroom, brush my teeth, urinate, wash my hands, put on shorts, socks, sneakers, and T-shirt, then make my way downstairs to exercise. I'm usually down there within 8 minutes, because I move a bit slowly in the mornings. I would guess that I also daydream a bit, because those tasks don't seem like they should add up to eight minutes. It's difficult to get an accurate read. For one thing, I always forget to grab the stopwatch as I shut off my alarm and emerge from the bedcovers. For another thing, who knows when to click the stopwatch button? When I brush my teeth, do I time the walk from my side of the bed into the bathroom? Do I begin timing once I cross the bathroom threshold? Once I stand in front of the mirror? Pick up the toothpaste? Certainly once the brush contacts teeth, "tooth brushing" has commenced. But then when does it end? Once brushes no longer touch teeth? Just after I rinse the brush and finish flicking the bristles with my thumb? To complicate matters more, and in accordance with twentieth-century physics and old wives from centuries past (who knew that a watched pot never boils), I learn that when I am timing my brushing for posterity, I tend to keep at it longer, just as when I share a bathroom at a campsite, I like to shuffle the bristles round and round until my neighbor has finished. It's as if we're both slow-racing, trying to be the most hygienic. What I'm trying to say is that I never brush my teeth for the full recommended two minutes, unless someone is watching me. Most mornings, I get the toothpaste on, in, dispersed, lathered, rinsed, etc. in 57 seconds. That's an average. I might also average the time I take on my other tasks, but let's just say that before I leave the house for work, I've spent almost two hours mostly on basic personal maintenance. When my children wake up around seven, my interactions with them are quick and perfunctory: "Get up; get ready; did you brush your teeth? make sure you eat breakfast"; etc. None of it is what we call "quality time." 17:23 conversing with my brother Dave about the VitaMix blender, music, health, old photographs, etc. 14:03 driving to Kohler's food store to get breadcrumbs for milanesas for dinner. Plus, I apparently did some other stuff. Notice that those numbers don't add up to anything remotely like a whole working day. They're barely half of one. Once all the kids were home from school, we told each other how our day was going so far and...frankly I don't quite know what else we did. I forgot to time it. We likely did some kind of cleaning. Maybe I showed them the new wardrobe. We did not joke about escaping through it to Narnia, though for the sake of this essay, I wish we had. I'm certain that we ate dinner, but only because we do that every day. We might have watched an episode of Phineas and Ferb on Netflix (we do this often). But the fact is that the day's events did not imprint on me any particular memories, and when I reflect on this fact, I become melancholy. No wonder we hope for a heaven of restoration and continuation, angels recording our every deed and every thought, eternity to increase in knowledge and empathy with our most loved ones. Later in the day, Karina came to campus with our three youngest children to share a lunch with me. We sat just south of the art museum, on a stone bench along a stout wall of greenery. The kids raced to the museum stairs and back while I timed them on the stopwatch. Daniela's record was a dad-assisted 17 seconds, though sometimes she hung back and encouraged her 2- and 3-year-old brothers, bringing her, and them, back in around 25, sometimes 30. We sat for almost an hour, munching and laughing, Karina and I chatting, the boys exploring among the plants, sneaking away as far as they dared before turning back to the safety of their parents. Daniela kept running, her hair fluttering, arms flailing, skinny legs leaping ever forward. When we finally called the children to go, it took 10:08 just to get them to the car. That was the price of patience in this instance. We did not cajole, did not bribe or threaten, did not pick them up and carry them where we wanted them to go. We simply meandered toward the parking lot, pausing often as the children found a new rock or an alcove in the bushes to investigate. I had things to do waiting for me at my desk, but I spent the moments extravagantly on my family. The boys will not remember the day at all, and even reading about it, as I hope they will do in the future, will not jog anything more than the vague recollection of that terrace surrounded by buildings, a place we'll have visited often. Daniela, though, if we talk about the races soon enough, may fix in her mind some recapturable sense of that wind-through-hair, that jostling-through-grass, that dappled light-through-leaves. Already she's surprised me by recalling events I'd nearly forgotten, sometimes from years ago, when I thought she wasn't paying attention, like the long, apocalyptic conversation we had on her abuelos' front porch when she was three; she told me the trees would catch fire and the birds would fall in flame. She's such a strange child, always leading with nonsequiturs, speaking in future tense for things that have already happened, seemingly processing life at a different speed from the rest of us. They say that our first years imprint us indelibly, shape our selves in unalterable ways. So I take care to get my children out of the house, turn off the television, limit their video-game playing, stock the shelves with good books and encourage them to read. We have a large backyard and a small, undeveloped city park behind that. There are kids to play with all over the neighborhood. But those first few years of childhood experience produce no definable memories, only general impressions that we cannot trace. So maybe one reason I'm so obsessed with moments is that I'm surrounded by little people who can barely conceive of time's passage, who cannot form the merest thought of their own mortality, who have no access to notions of events because they do not yet form memories. I worry, too, that they are losing me minute by minute, yet they see me as a static creature, fundamentally extant in their lives, pre-existing them and always-to-be. I am Dad, a decent fellow who works a lot and lets them get away with things, who tickles and wrestles and reads stories. They have not noticed my steadily graying hair or my deepening wrinkles. If I am forty today, then perhaps I was always forty, or perhaps forty is essentially the same as twenty-six, my age when the first of them was born. It might as well be. Yet I see them change like garden plants, each day a little closer to ripeness, transforming from wrinkled gophers curled into the space between my elbow and hand, into long-boned, long-haired antelopes just in the time it's taken me to write this essay. Maybe another reason is that I'm yoked with another person who disparages time's passage. Karina is habitually late (church, meetings, parties, dinner) yet never seems to care. Perhaps this is her Uruguayanness showing, but it's a source of stress for me. My daughters exhibit some of the same tendencies, finding a way nearly every morning, no matter when they wake up, to be gulping down a last spoonful of cereal and ripping a brush through their hair as they stumble to slip on sneakers and sling an unzipped backpack over one shoulder when the neighbor kids ring the doorbell so they can walk to school together. Because I'm often the one in charge of getting them safely started, I am again subject to stress. No matter what I do, they never seem to care. And it's not just not caring; with Karina, it's a kind of perpetual self-delusion about what can be done in a certain number of minutes. Ten minutes before our Sunday services start, she'll get into the shower. Fifteen minutes before our guests are to arrive, she'll head to the store to buy another bag of cheese curls. On the rare occasion that she asks me whether there's enough time to do such-and-such, I always answer "no," and I'm always right. Yet she is always right, too, that it simply doesn't matter. So we sit in the back of the church, or I entertain our friends and explain that Karina will be home shortly. Who cares? They're used to it. In a big way, I wish I could be more like her; I try to turn off my anxiety and lay back. I've done some amateur's study of the longest-lived people to have graced the earth, and the most common factor among them is "immunity to stress." This is far from my natural state. During the Madden family trip to Europe last spring, we ran for every single train we took. Literally ran. Two haggard parents and six energetic children, two in strollers pushed by their siblings, everybody wearing a backpack, big kids rolling wheeled suitcases, Karina and me wheeling and carting two large suitcases each, one with a duffel bag perched precariously on top. In a twilit cavern, we dash alongside the train, huffing with anxiety, shouting instructions and encouragement to one another, finally arriving at the nearest door, then tossing bag after bag after bag into the vestibule after unbuckling and tossing child after child after child into the train so-close-to-departure-it-seems-to-be-rolling-its-eyes-and-tapping-its-foot-with-impatience. The first time this happened was from London to Liverpool. After settling into the surprisingly unoccupied car, then breaking out the snacks, then sitting still for ten minutes, I began to suspect that something was up. Out the window I saw a conductor walking past, so I ran out to ask him why we weren't moving. Looking at his wrist, he said, "We're not scheduled to depart for another 45 minutes." He clarified that there had been another train on another track that had left promptly at 9:10; sheepishly, I returned to tell my family what we'd done. We had a good laugh about it and simply cut short our visit to the Beatles' sites by an hour (and wound up running along Menlove Ave. to catch our city bus back downtown later that afternoon). So, technically, this first run-for train was a mistake, maybe a lesson. But I failed to learn it. And from London to Paris and from Paris to Kaiserslautern and from Kaiserslautern to Frankfurt, the trains really did begin to roll only seconds after we'd boarded, all flustered and giggling. An inconvenience is only an adventure wrongly considered. --"On Running After One's Hat"
The point being that a great deal of our pleasure or misery is determined by our attitudes. So I revise the fusspot I was, experiencing those tense moments, into the father I am, telling the story of our many nearly missed trains, reenvisioning our ragtag band rumbling through the stations never knowing whether we'd make it until we'd made it. We sit at the dinner table of late, smiling in conversation, my wife and children rightly making fun of my anxiety, as we recall our day in Liverpool walking fast from Strawberry Field to St Peter's to Mendips, a kind of pilgrimage to be in those places that shaped the man who wrote the music we love so much. Patrick Madden is the author of Quotidiana (Nebraska, 2010). His personal and travel essays have appeared in Fourth Genre, Hotel Amerika, the Iowa Review, Portland Magazine, River Teeth, and other journals, as well as in the Best Creative Nonfiction and Best American Spiritual Writing anthologies. He teaches creative nonfiction at Brigham Young University and Vermont College of Fine Arts.